After studying the world's major religions last fall in an intensive extracurricular program, the College's four inaugural multifaith fellows were asked to share some of their new knowledge and understanding with the campus. Last fall, Director of Religious and Spritual Life Eduardo Pazos chose four students to pilot a new Multifaith Fellowship to study the world's major religions and read some of their most important sacred texts. The four students applied for their spots, and each received an award (paid for by a grant from the Interfaith Youth Core) to participate in weekly evening seminars. Part of the program required that they each organize a community event after the program ended. Three of the fellows—Abby Wu ’21, Lucas Johnson ’22, and Nick Suarez ’21—organized well-attended campus gatherings this spring, inviting students to reflect on open-ended questions about different religious beliefs and practices. The fellowship's fourth student, Caleb Perez ’20, is helping Eduardo Pazos plan the second Multifaith Fellowship program for the fall. 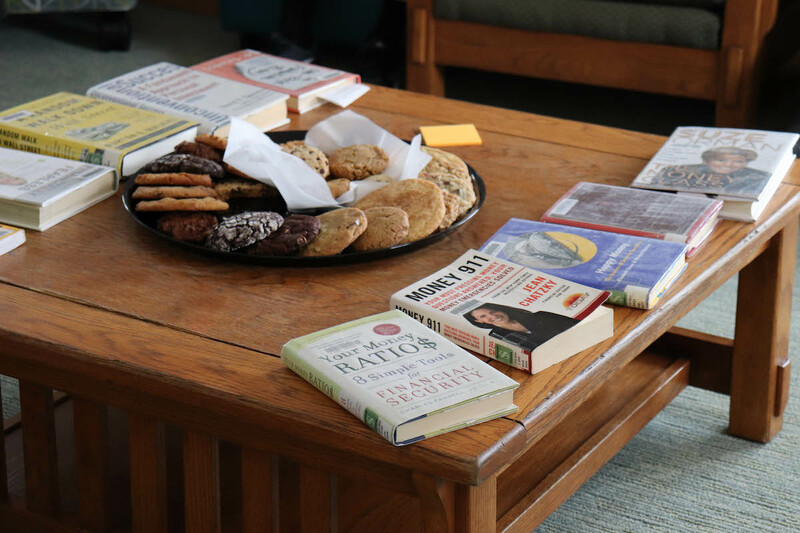 Wu hosted a discussion in Burnett House on whether it was problematic that Americans seeking relief from stress borrowed from Buddhist meditation traditions, often divorcing the practice from its religious origins. Suarez led a discussion in Howell House on modesty, women, and Islam, asking students to think about modesty not just in Islamic contexts, but in Western cultures as well. Johnson invited clergy from different religions and Christian denominations to address questions on faith, hope, and what they see as the future of religion and globalization in an event he organized in the Roux Center. Pazos said he was pleased with both the content of the fellows' campus programs and the outcomes. "One of the goals of the fellowship was to increase conversations among students and on campus around religious engagement," Pazos noted, "and to increase awareness of intersectionality among religions and spirituality." Indeed, a couple of the multifaith fellows said the biggest takeaway from the fellowship was discovering how deeply the connections run among Buddhism, Christianity, Judaism, Hinduism, and Islam. "One of the things I got from the fellowship is that there is so much more unity and cohesion among different religious practices than differences," Johnson said. "It really showed me that more than anything, there is so much more that unites us than divides us." Suarez said he saw a lot of commonalities among the religious texts, "like the peace they preach." He added, "You read them and are inspired to be a better person." What was notable about the student events, particularly Wu's and Suarez's, was that they didn't present arguments or invite a scholar to give a lecture. Instead, they asked a series of questions and had students gather in small groups to discuss them. Wu, who was raised in North Dakota and attended a charismatic Christian church, said she designed her event on Buddhism to avoid quick and easy judgment. "I thought about this in the Twitter sense, where there are a lot of people calling out others for cultural appropriation, canceling someone for saying something wrong," she said. "I wanted my event to be more like, 'here are these questions, let's listen to other people talk and help you formulate what you think.'" At Wu's event, she posed the following questions: Have you ever meditated? Is the practice devalued when used in the West without acknowledging its origins? Where is the line between cultural exchange and cultural appropriation? What are some ways we can be respectful of mindfulness teaching and activities? Suarez, who was raised in a Catholic family in Washington, DC, said much of his interest in exploring modesty, Islam, and women was inspired by a sociology class he took at Bowdoin called Gender in the Middle East. While he wanted people to examine their ideas about modesty, faith, and women, he said he also wanted his event to help "erase a preconception." "If you don't know anything about veiling in Islamic culture, you might think it is just an oppressive practice," he said. "Many people don't understand why women choose to do it." At his event, Suarez asked: What are some preconceived notions you might have when you see someone wearing a veil? What does modesty mean to you? How or where do we encounter questions of modesty in our own society? Do you believe modesty is a personal choice, or is it influenced or shaped by a dominant narrative? Johnson, a practicing "progressive" Catholic from Charlottesville, Virginia, invited leaders of churches, synagogues, and mosques to participate in his interfaith panel, ending up with clergy from four Christian denominations. "I wanted to talk to them about why it is important in Maine, the least religious state, to have religions that engage the community," he said. Pazos said Johnson's interfaith event reinforced what he hopes to achieve with the Multifaith Fellowship. "It brought up the need in our society to talk about common ground and unity rather than issues that divide us," he said. A liberal arts education at Bowdoin offers classes in the humanities, sciences, and arts, of course, but it also often offers students pragmatic workshops, like how to find an apartment and manage your finances. 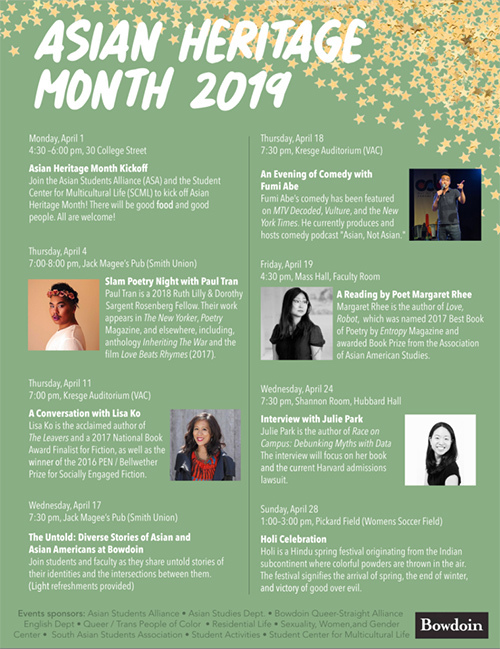 Throughout April, the campus will host events honoring the Asian community and its many contributions. 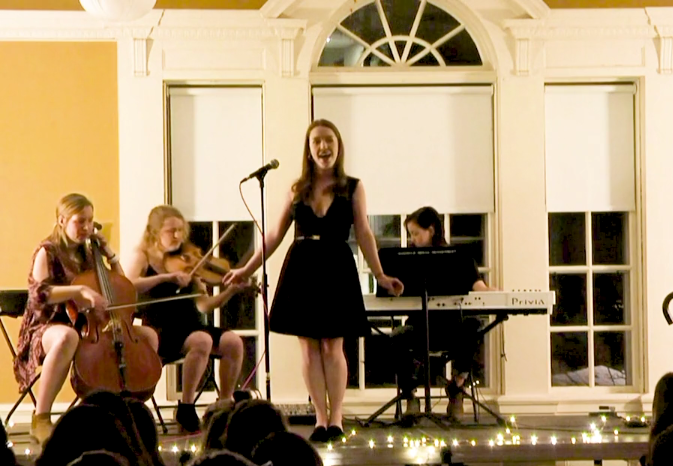 By performing pop, jazz, and theater songs with sexist lyrics, the Bowdoin Women's Cabaret breathes new interpretations—and also a fair amount of comedy—into retrograde tunes.